You would think the combination of a new NAFTA deal and a great BOC Business Outlook Survey would be a tailwind for Canada but it hasn't worked out that way. 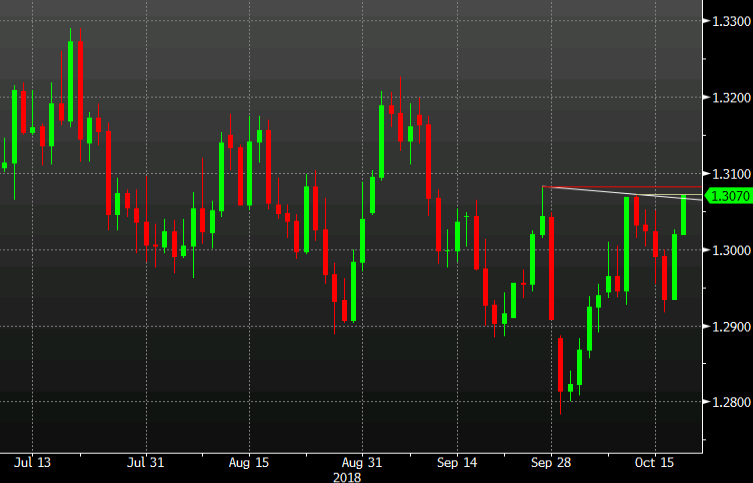 USD/CAD is threatening the October 10 high of 1.3072 and the late-September high of 1.3082. Watch for cascading buy-stops on a break, which would drive the pair to a five-week high. Oil has been a drag for the past two days but even as WTI halves its gains, the loonie remains under pressure. It's struggling because of deteriorating sentiment in equity markets. The S&P 500 is down 39 points to 2769, just above the earlier session low. Tomorrow is a big day for the Canadian dollar with retail sales and CPI data to be released.